People are staring. And yet, she keeps smiling. 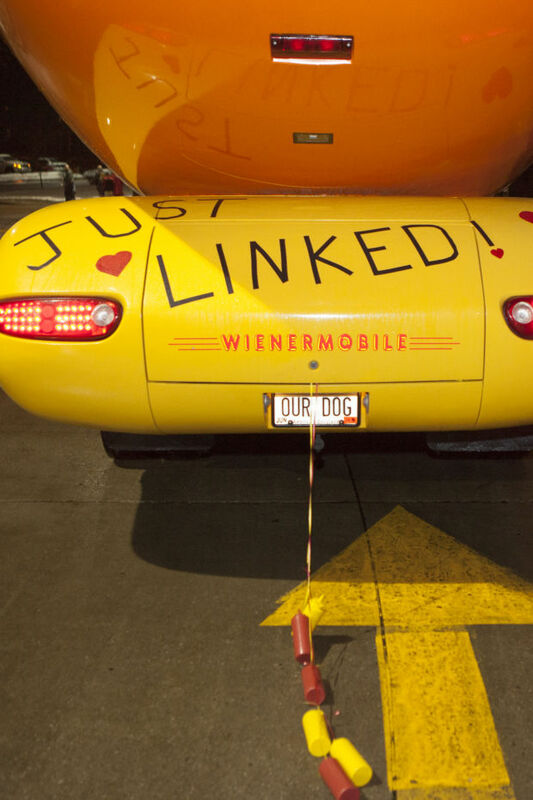 It isn’t every day that a Wienermobile cruises the streets of Austin. But for Connett, driving the Wienermobile is her day-to-day routine. Inside the giant hotdog, the walls and floor are painted ketchup red and mustard yellow. With a TV, four extra seats for friends and a cloudy sky as a ceiling, it’s always a “franktastic” day in the Wienermobile. As “hotdoggers,” Connett and 11 other drivers travel around the United States for 48 weeks out of the year, going in and out of hotels all around the country. “You have to have the travel bug to really enjoy this job,” Connett says. Connett serves as an Oscar Mayer brand ambassador, recruiting students at universities, talking on radio shows, attending parades, going to sporting events and promoting events for corporations and charities. “We have to execute all of our events. We do our own PR, marketing, sales and behind the scenes work while we interact with thousands of people every week,” Connett says. She decided to drive the Wienermobile because it would be a cool way to finish college and have a year off before entering the “real world.” While many of the drivers work in PR or marketing after they finish driving the Wienermobiles, Connett says she has other aspirations. “I want to work on films. I’m considering on moving out to Los Angeles to work on some features,” she says. While Johnson says he’s glad his travels have helped him avoid the Minnesota snow, Connett says she always misses her family in Texas and Georgia. “You’re meeting all these new people, but you don’t see familiar faces. Even with vacation time to see family and friends, you begin to miss them,” she says. Connett’s family supports her job and travels. Her mother visited her in Memphis and she gives her friends and family rides in the Wienermobile while in Austin. She says, with a colorful ride like the Wienermobile, she never fails to draw attention when she drives from city to city. “When I drive, I feel like a celebrity. People swarm us and we’re always in the spotlight,” she says. Along with the fame comes some fortune, too. While the salary is competitive, Oscar Mayer pays for the drivers’ food and accommodation. This allows her to spend her $30,000 salary the way she wishes. As the wiener on wheels packs up for New Orleans, Connett takes out the last round of weenie whistles, stickers and brochures to give to students. Before the hotdogger duo drive off, people yell, asking for Connett and Johnson for hot dogs.